Casa Lera is known by some locals as the 'jewel' of Amandola. This 1800s river-stone farmhouse was artistically restored in 2010 to combine original features with modern luxury. It features a stunning lap pool, dining terrace, lawns, fruit trees and a small vineyard. The large kitchen is perfect for those who love to cook. Dine inside at the large country table, or outside on the well-lit, covered brick terrace. 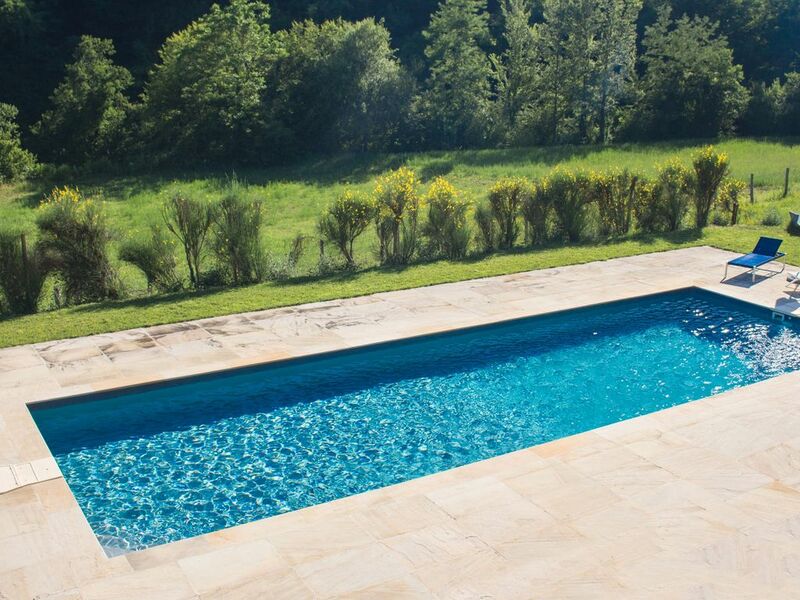 The 13 meter pool is decked with elegant stone, and has an outdoor shower and quality lounging furniture. It enjoys full sun all day and offers stunning views of the stars at night. Less than 5 minutes from town, Casa Lera is in a small valley within the Sibillini National Park. At the foot of the property a footbridge across the River Lera leads to hiking and biking trails. The home is conveniently situated near main roads from which to explore the historical villages of Le Marche, swim in the Adriatic, visit local markets days and festivals, or hike the trails of the Sibillini mountain range. The main house offers 3 bedrooms, 2 bathrooms and a sitting room upstairs. The ground floor features the large kitchen and dining area, a living room and full bath. Just across the lawn is the 'pool house.' This room can be used to relax and overlook the pool, or to enjoy our very large DVD film collection. The sofa converts to a comfortable double bed. The pool house opens to the covered terrace. There is a spiral staircase that leads down to the fourth bathroom and the garage (adjacent to the pool area). In the garage is a separate laundry room. We are Californians who love to travel. Our experience in renovating this home has had a profound influence on us. We are grateful for the genuine sense of welcome that we feel here. The people we have encountered, including those who mind the house, are generous, friendly and helpful. We were looking for a base for our adventures, and were continually drawn to the history, cuisine and climate of Italy. We found Le Marche to offer the sea, hiking in the mountains, and the feel of rural Italy that we missed in other regions. Having rented some not-so-great places in the past, we knew that we wanted privacy without fighting long, difficult white roads. We wanted to hear the birds and the river at dawn, and not the neighbor's chickens. We wanted cell phone coverage and internet. We love the feeling of isolation, with the option of zipping into town for provisions or a meal. There are no next-door neighbors, but passers by will always wave hello. We are continually discovering new things to see and do in the area, but sometimes just want to stay home. The house is truly comfortable, and we have tried to make it a home away from home for our guests. It is honestly a lovely, peaceful corner of the earth. Bathrooms all include bidets, except in pool house. Bath 1, en-suite Bed 1, shower, Travertine vanity. Bath 2, shower/tub combination; Carrera marble vanity. Bath 3, ground floor, shower, contemporary wood vanity. Bath 4, pool house, small shower. We ask that you park outside, as the garage is in use. We provide towels, including pool towels! Drip and espresso coffee makers. Electric kettle as well. General spices are usually on hand, and you are welcome to whatever is in the kitchen. Well appointed kitchen. We love to cook, and to eat! The large, fully appointed kitchen combines with an open dining area (the 3-meter table seats at least 10). Features: gas stove (5 burners) with electric hood and lighting, oven, kitchen prep island, dishwasher. Counters are of Biancone Bianco marble. You have the option of dining outdoors on the covered terrace for every meal. Generous MP3 player; requires use of converter (supplied). Television is hooked up to international DVD player. We have many films on hand. Library includes many books on touring and hiking in le Marche, and the surrounding regions. Board games, puzzles, cards and bocce. Fruit trees, lawn areas and a small vineyard. Slopes at Sarnano are 20 minutes away. Tennis courts are in Amandola. You need your own raquet and balls. Golf is available at various locations in Le Marche. Ground floor bathroom is accessible, but property may be a bit cumbersome for chairs. Casa Lera is perfect for indoor-outdoor living! The main house and pool house open to a lawn, garden, fruit trees and a small vineyard. The covered terrace is perfect for dining and relaxing. It overlooks a small valley, including the 13 x 4.5 meter pool, also surrounded by lawn. The pool takes full sun all day long. At night the stars overwhelm; there are no immediate neighboring structures and so no external light sources. This agricultural community is centrally located between the mountains and the sea, and close to historical towns and sights. Environmental features: The home has been remodeled according to state-of-the-art standards. It has been architecturally engineered to withstand seismic and environmental conditions. The insulation of the roof and structure eliminates the need for air conditioning. The home stays very cool in summer, and fans are not needed. Passive solar panels help to heat the water for the home, and an underground cistern collects water for irrigation purposes. An original hay barn is located on the property but is not currently in use. Casa Lera is a real find and we had a wonderful two week stay for our multigenerational family. The added bonus is that you are not overlooked, feel like you are isolated but in reality are a five minute drive to the town centre, it’s even walkable! This is our fourth visit to the Monti Sibillini region so feel we are beginning to know it quite well. The draw is the hiking in the mountains but also the wonderful little towns, the food, the people and the weather (which in the mountains can be unpredictable). Another draw to this area for us is that it is off the tourist map and therefore you get more of the ‘real’ Italy. We took part in a few of the local events in the nearby towns and felt welcome. Casa Lera has been sympathetically renovated to modern house standards with all the mod cons you would expect. There are enough spaces to be together as a family but also to have some privacy. We made full use of all the bedrooms including the pool house. The beds were all comfortable and the pool house sofa bed was the best one I’ve slept on, very supportive. The pool is kept immaculately and regularly cleaned etc. The property manager was attentive to our needs when we had any and equally checked everything was ok.
A wonderful two weeks. We will be back. I can really recommend Casa Lera. What an amazing setting! Set amongst a national park and perfect for a taste of the real Italy! The property has been refurbished to a very high quality and with every thought given to the needs of guests. Swim in the fabulous lappool, laze on the deck, contemplate the beauty of the scenery, visit the local village for fresh produce and ice-cream! - or be more adventurous and go hiking. What a place! A country villa like none other! Casa Lera is an exquisitely designed and tastfully restored retreat. We enjoyed our meals outside on the patio overlooking the Sibilini forest and mountains, loved swimming in the gorgeous pool, took great hikes with breathtaking views, and strolled into town for delicious meals from the local restrautants. The house and garden were well-maintained and the hosts ensured our stay was comfortable by providing little luxuries for us...a welcome basket with wines and fixings for a meal the night we arrived. I will definitely book Casa Lera for our next family trip as it has something for everyone in our family. Casa Lera is a gem. Lazy meals on the terrace, the sound of cicadas, access to some of the most beautiful but understated mountains in the national park, sublime food, delightful hilltop towns. Casa Lera is exactly what it says on the tin. Brilliantly renovated, with nice touches like the salvaged doors and tools strategically placed around the house but with a very practical kitchen, ideally equipped for proper family cooking with the amazing local produce. The house is the perfect base for a family or group of friends who want to getaway from it all. The house has been so well done that it's hard to decide whether you want to stay home for the day or go on adventures to discover the enchanting Le Marche. We arrived on the big summer August Bank Holiday (Ferragosta) in Italy and supplies were generously left for us on arrival to keep us going until after the shops opened. The housekeeper was incredibly friendly, helpful and efficient. And the pool was kept discretely clean throughout our stay. We walked in the mountains with our two boys, a lot of swimming races in the pool and thoroughly enjoyed discovering the area. Though we struggled to find a tourist information where anyone spoke English or had much useful information! We just did it our own way, helped by the house's maps and comprehensive info. We thoroughly enjoyed popping into Amandola for a wide variety of evening fiestas. This is the second time I was able to stay at Casa Lera. The listing cannot describe the feeling you obtain when you arrive. The old farm house has been rebuilt with care and beauty and has all the niceties of this century but without giving up the charm and privacy. It is CLEAN and backs up to open space with fabulous hiking or mushrooming. The pool is perfect and the old Pizza oven can cook pizza, veges, chicken.. whatever to perfection. The little town of Amandola is close and you can get fresh bread from the bakery and twice a week, the little village offers a farmers market with produce that is fresh. We traveled to little towns using Casa Lera as a base-- even to the outdoor Opera one night (about 1 1/2 hours away). The owners have a book with things to see and do-- of which there are many. If you just want to relax, this is the perfect place as well. It takes a little over 3 hours from the Rome airport, closer to Bologna so use Google Maps on your phone, pre- downloaded so easy to obtain. The people of Amandola are friendly, and the markets and shops sell local, fresh food. The restaurants offer authentic, handmade meals and traditional dishes of Central Italy. Grocery: Wednesday is market day! It is open until 1 or 2. (The market is in Comunanza on Saturday, and Sarnano on Thursday.) In Amandola, you will pass a main grocery store (Conad) on the way to our house. There is another, larger market in a small industrial area just on the other side of the soccer stadium. Turn right at Ristorante Bella Napoli, and then left after the gas station. The store is on your left (Sigma). For a big shop on the way into the area, look for larger supermarkets. There are also several shops in town that carry specialty food items. At the top of the Piazza is our favorite baker, but we also like the one by Conad, on the backside of Ristorante Bella Napoli. A good butcher is just past the block before the pharmacy, to the left as you head to the Piazza. It is down a small driveway. In the Piazza there is a new vendor of local goods. Some of these items are unique to our region, especially the cured meats. Not to be missed! Also, just under the arch of the Piazza is a wine seller/fruit vendor. Gelato: While Café Belli is on the Piazza, the locals tend to frequent Casa de Gelato on the main street, next to the pharmacy. Restaurants: Ristorante Bella Napoli, next to Conad, is an easy favorite. Plus the pizza is great, and you can order take-out. The Gorbe e l’Uva, (go all the way to the end of the soccer stadium parking lot) offers great food, and she will make just about whatever you want. Towards Montefortino there is a gas station, and just underneath is another restaurant we like: Fontedella Valle. These are just a few. There is a great deal of information at the house on local restaurants. Walking and Hiking: Our street is a favorite of the locals for their daily ‘passegiata,’ as it is not as busy as the main roads, and winds along the river through the forest. As you head up the hill you find trailheads onto paths, as well as dirt (white) roads that take you through small hamlets. You will note that some trails are marked for hiking or biking. There are numerous trail maps in the house, and the paths are generally well marked throughout the area. You can walk down to the river along our property and pick up some of the trails from there. One popular hike not to be missed is the dramatic le Gole dell’Infernacio. The trailhead requires a short drive toward Montefortino, then follow the signs which takes you to parking at the end of a white road. The Anello is the ring trail that circles the Sibillini Mountains. You will find guidebooks at the villa. Seasonal Events: July and August in Le Marche are busy with local festivals (festas or sagras). In the Fall there is the White Truffle festival. Watch for signs around town, or visit the Tourist Office in the Piazza, adjacent to Café Belli. Coast: The beach is just about an hour away. Take the road to Comunanza, then head east toward Pedaso. There are a series of beaches as you head south. You can rent chaises (lettini) with umbrella for the day, and lunch on fresh seafood. Alternatively, to the north on A-14 is the Conero coast, or Conero Riviera. Water Park: There may be a new water park in Le Marche at Verde Azzurro Holiday Village, which children will especially enjoy. We have not been. Day Trip Destinations: The nearby city of Ascoli Piceno often has special events going on. The shops are interesting, the piazza is beautiful and the cafes offer many selections. There is a walking tour of the city that shows you how to spot its many ancient towers. Going north you can visit the depths of the Apennine Mountains, by touring one of the largest underground caves in the world, the Grotte di Frassasi. Walking tours are available, as well as more in-depth visits where you are outfitted with special gear. Nearby is Fabriano, which features a small museum that details the ancient art of papermaking. There is also a bicycle museum with an interesting collection of travelling vendor cycles used in early Italy. In that same direction is Assisi, (home of St. Francis of Assisi), which is always lovely. Heading north and west you will find Urb Salvia, which has an archeological park, a Roman ampitheater and an archeological dig. In the town (on the hill) there is a castle you can tour. Further west is Loreto, which has a cathedral that contains Mary’s home (flown there by angels). Further north is Urbino, where there is the palace of Federico da Montefeltro, who is known as one of the driving forces of the Italian Renaissance. Go further to the independent country of San Marino. If you like opera, the Sferisterio Opera Festival of Macerata is held in an historic outdoor theater. It is pretty special. We usually purchase online ahead of time, but you should be able to get tickets at the door if you want to be more spontaneous. Changeover Day: Saturday is preferred. email us for details regarding booking. We look forward to hearing from you!